This report will cover our first playtest with the near-final board artwork. The Mico does it again. The new art is amazing. I’m particularly fond of the location where players can gain Magic. It’s bright, vivid, and…. magical. All of the fine details that he adds to his work really makes the map feel alive. In this test we tried a few different changes and tweaks. Today I will be focusing on the card play of the game and some of the changes made to those cards and how they work. In Margraves, players have two general options for what to do on their turn: Move their Margrave token, resolving the effects of the location that they visit, or use a Citizen card from their hand to take its action. The primary things that players will be doing with these options are defeating Monsters, gathering resources, or spending resources to build Ward Towers or to move your ship. Now that you know a little bit more about how the game works, it’s time to talk about these Citizen cards. Players begin the game with a hand of starting Citizens and will have the ability to recruit more of them at the city of Prima, if they are willing to part ways with a little Gold. Every time a player decides to play a Citizen card it goes into that player’s discard pile afterwards. Players don’t regain these cards until they play their Herald Citizen card to pick them all back up. 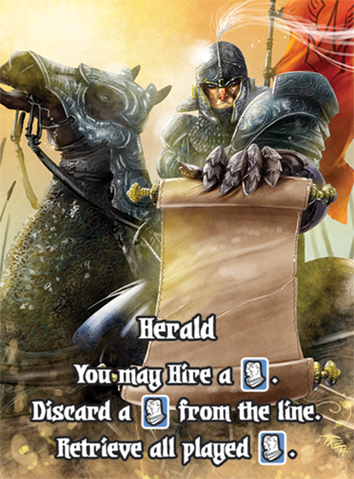 The Herald is great because not only do you get all of your previously played cards back but you can also get to acquire a new Citizen instead of traveling to Prima (while still paying the current cost). The starting Citizens aren’t slackers and are quite good on their own. Some of them even have unique abilities not found anywhere else in the game. However, some of the Citizens that can be hired give players access to new types of actions and, very importantly, Guild icons. Like in other Valeria games, one of the paths to victory is aligning yourself with the various Guilds and accruing points along the way. For this playtest one of the primary focuses was to get more resources into the hands of the players early. One important change that helped with that goal was changing how one of the starting Citizens worked. In previous iterations the Merchant gave 1 resource of the player’s choice and 4 Gold, but now it gives 2 Gold and 2 resources of the player’s choice. It’s a minor change, but it did seem to be the nudge that the game needed. Another minor change was lowering the amount of Gold that the Monk gave from 2 to 1. The Monk’s ability was already powerful enough and some other ways to boost your Gold income were added, so it felt like the right thing to do. In testing that proved to be true. Overall, the power level of the Citizen cards seems to be in a really good spot. I imagine very few changes will be made to them after future playtests. 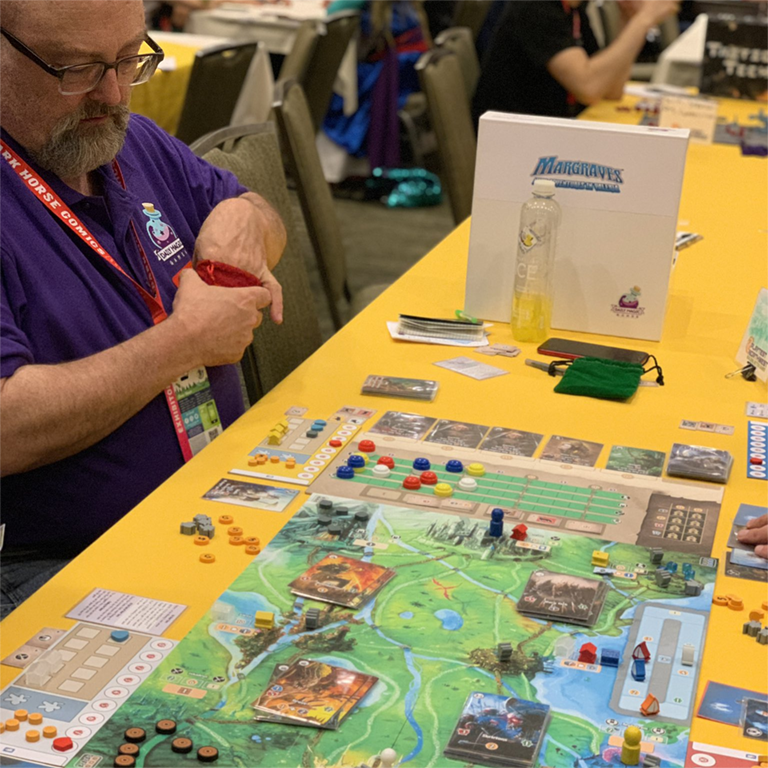 After making those changes we then brought the game to be tested at Emerald City Comic Con as part of the Playtest Northwest event. The reactions were great! Overall, everyone seemed to really love the game. We did notice that the game was running longer than we would prefer, especially at 4 players. So our next testing session will involve speeding up the early game a little bit more and playing around with various Gold costs. We have several ideas that we are eager to try out.